Walking into my shop you can see what is important. A band saw sits near the door, rust accumulates on the table, the blade wrapped around the adjustment knob and a spider seeks its next meal. Across the room is a jointer covered in dust and rust from lack of use. The metal cold, lifeless. 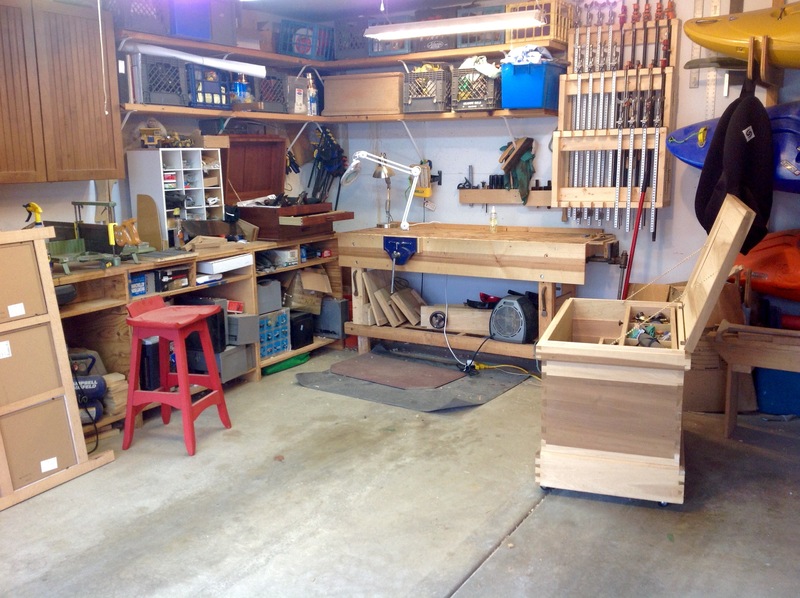 Before you is a bench, not a Nicholson or Roubo, but a bench built by a teenager and his father, modified and strengthened to fit a new purpose. Looking to the right is a large chest unfinished, but inside tools stand oiled and sharp anticipating the next task. On the left a smaller chest immediately at hand. Beneath the lid sit planes needed each day wood is worked. In the first drawer, chisels, marking knives and measuring tools. The second drawer contains saws, R.Groves from the 1790’s and Bad Axe Tools from LaCrosse. Across the shop,diamond plates ready to sharpen, unfinished projects and lumber unworked. As a new project begins I reach for specific tools, some I put to use, others give me a sense of place. The mortise gage with is curved edges fits carefully in my hand, the Stanley number 7 brings to mind the many lives it has touched over 125 years. The R. Groves saw shows the marks of several lifetimes work. These tools hold secrets that are out of my grasp, but they pull me in. As the metal passes through the wood fibers, the tools speak, the handles warm and their soul shines. Why do certain tools have a soul, while others sit cold and lifeless? Spending the weekend sharpening saws with the team at Bad Axe Tools I had time to reflect on the art and science of tool making. Years seeking knowledge past and present, months finding the best steel and components and hours of sharpening, all for the birth of a saw. Watching the team I learned the steps of assembly, the areas of caution, I saw the precise movement of hands and eyes seeking perfection. I began to realize that components are only a small part of the soul, the majority comes from the passion of the saw maker. 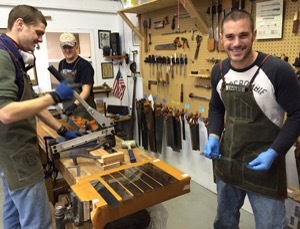 Walking into Bad Axe Tool works you sense that passion is in abundance. Listening to the team build saws I feel my responsibility grow. The responsibility of the saw user to assemble the last piece of soul. As the the saw is worked and furniture built. Hands wear the handle, files shape and sharpen the blade, coats of wax and oil seep into the back and handle, scratches and dings appear. The saw becomes experienced and the soul strengthens and grows. When the time is right, and the saw passed forward, the soul becomes the responsibility of another and another. 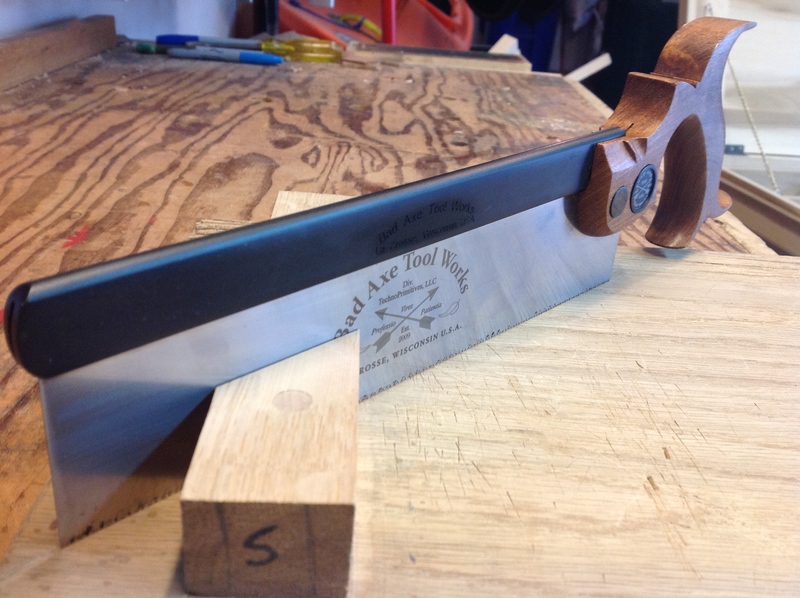 My Bad Axe Tool Works 15 ppi dovetail saw…. Perhaps you should consider tools with soul…….. Interesting that you’re blogging about Bad Axe, I’m questioning whether I’d like to get a sash or tenon saw for myself or January birthday wish list. Already have L-N rip and cross cut dovetail saws but which would you suggest to get for primarily crosscuts, lap joints, and tenon work? I have used the LN saws although i dont own one and they are good. I think Bad Axe has an edge. 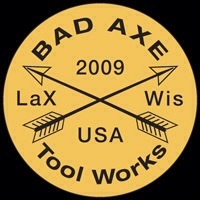 If you call Mark Harrell at Bad Axe I think you will find him extremely helpful. 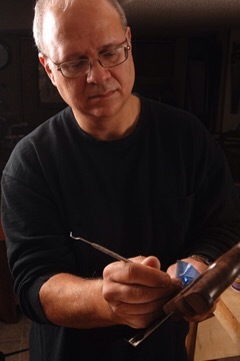 He will customize the sharpening to your liking and specific wood. Additionally the ability to select handle size, wood ( they will make a handle from your own wood also) back and saw nuts is a bonus. Thanks, I will check out their site more closely and see how rich people seem when it’s closer to my birthday! I love your post and couldn’t agree with the premise more. I’ve found in our shop that touls with a soul and without lay side by side but with a clear difference as you’ve said. Makes me consider taking a look at what you have to offer.